Mazda MX-5 Convertible Interior, Sat Nav, Dashboard | What Car? 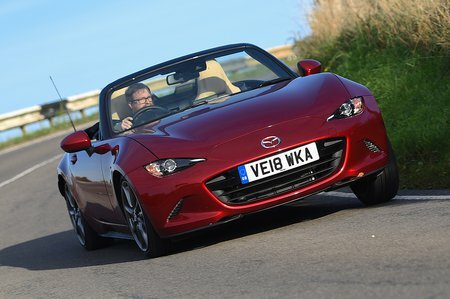 The MX-5’s driving seat is very low-set. You sit with your legs straight out forwards as if you were in a go kart, which can make getting in and out an inelegant procedure. The seat has a standard tilt-adjustable base; it's a welcome addition, but there is no height adjustment. The steering wheel adjusts for reach and rake, but taller drivers might wish it came towards them a little further. It's also worth mentioning that the pedals are slightly offset to the right. That said, all but the tallest drivers will be able to get comfortable in the snug seat, so long journeys won't be a chore. The high-set, stubby gearlever is in just the right place, and there’s a well-placed padded central armrest. The driver's seat offers plenty of side support in corners and the dashboard layout is sensible and easy to use. 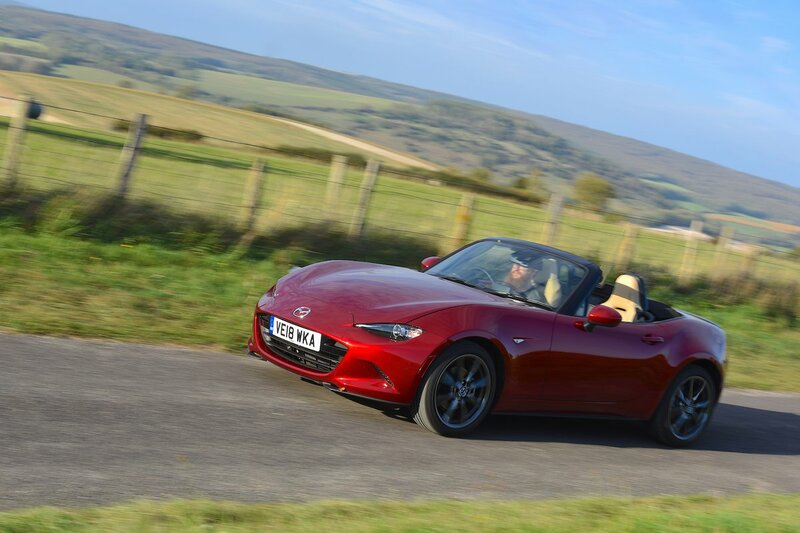 The MX-5 provides its driver with a clear forward view; you look down a sloping bonnet for a real sports car feel and the windscreen pillars don’t obscure your view at junctions and roundabouts. However, with the roof up, the view to the rear three-quarters is poor, and rear parking sensors are standard on the top two trims only. A reversing camera is standard on top-spec GT Sport Nav+ models and optional on Sport Nav+. Rear visibility is even worse on the MX-5 RF model, though, due to the 'fastback' buttresses that sit behind the headrests, even when the roof is down. Here’s the biggest reason to avoid the entry-level model: it doesn’t get the 7.0in colour touchscreen that forms the main interface and focal point of the dashboard in other trims. Instead, SE+ cars have a single CD player, an AM/FM radio, two USB inputs and a multi-function steering wheel. If you can, it’s well worth spending the extra for the 7.0in colour screen, Apple CarPlay, Android Auto, sat-nav, DAB radio and Bluetooth connectivity of SE-L Nav+ models and above. The system is easily controlled via a rotary dial and shortcut buttons located in front of the gearlever. The only irritation we've found is that you can’t turn off voice guidance on the sat-nav; you can mute it, but the system still turns your music down for gaps in which there would have been an announcement. The Bluetooth function works well, and you can hold a hands-free telephone conversation at motorway speeds, as long as you’re prepared to raise your voice a touch. You get two USB connectors at the base of the dash, next to a cubby that’ll take a mobile phone. 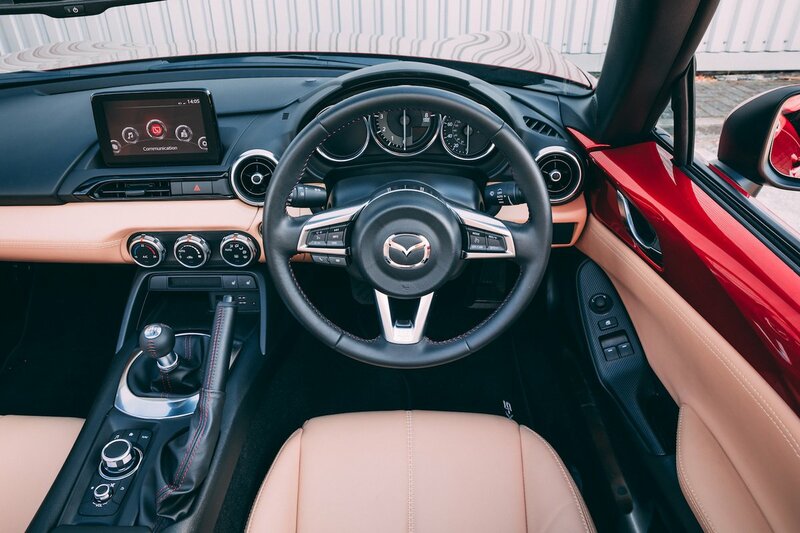 Previous iterations of the MX-5 weren’t known for their lavish interiors, but Mazda has tried to up the ante with this current model. Mazda's designers have made a decent fist of things, with an attractive array of textures, plastics that don’t feel too cheap and scratchy and a sense that everything's very well put together. Top-spec cars look particularly nice, since they get leather upholstery in a choice of colours with contrast stitching. That said, the Mini Convertible still has a decided edge over the MX-5 for interior quality.